North West Urgent Care & Walk-in Clinic offers immediate healthcare services to Toledo, Maumee and surrounding Ohio neighborhoods. 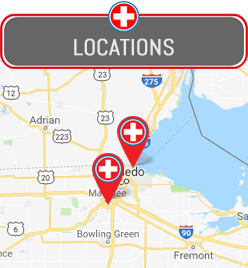 North West Urgent Care Toledo, OH offers a doctor near me when you are looking for an alternative in times when your primary care doctor isn’t available. We are also an excellent option in place of the Emergency Room for medical treatments that don’t warrant emergency care. At North West Urgent Care you can expect minimal wait times and low co-pays since we have contracted with many insurances. North West offers an urgent care nearby with medical professionals that are available to treat your various injuries and illnesses, 7 days a week. North West Urgent Care near Toledo is open from 8AM to 8PM every day. When you are looking for the urgent care nearest me, look no further than 1015 Conant St Maumee, OH 43537. North West Urgent Care is the perfect option for your medical needs. Call us at 1-419-333-8031 if you have any questions or just walk-in to our office; no appointment necessary! You can even check in online! When you are looking for quick urgent care services, North West Urgent Care Toledo is a great resource for you. However, if you need emergency medical attention for a life-threatening emergency, call 911 right away or visit the Emergency Room Nearest to Toledo, OH.